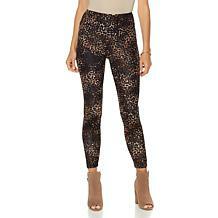 To put together a chic yet comfortable outfit, check out HSN's online collection of ponte pull on pants. A special ponte knit gives the fabric a nice stretch in all directions while still holding its shape. It will hug your figure softly and smooth out any imperfections. Ponte clothing won't fade easily and will last you a long time, as well. 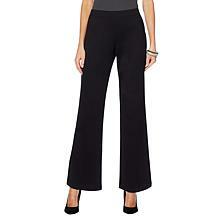 Ponte pull on pants by brands such as MarlaWynne and LYSSE are all about performance. Although many models are versatile and can be worn just about anywhere, some are best suited for formal wear. This pant offers a snug fit and contours to your figure, yet it's slightly more relaxed than many pants and allows for ease of movement. 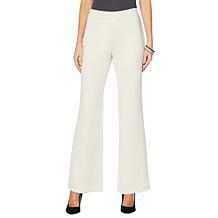 Most ponte pull on pants styles are perfect for work and leisure alike, depending on the top you pair them with. 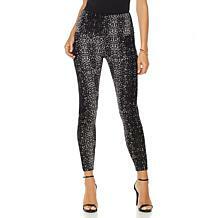 Ponte pull on pants all feature an elastic waist and give your body a lengthening and slimming effect. 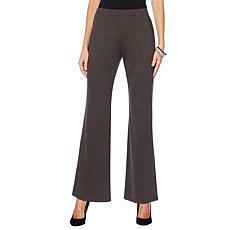 Due to their tight weave, ponte pants will keep you warm during colder months without feeling bulky and uncomfortable. For cooler climates, however, look for lighter variations of ponte pants.